The staff was amazing. Nothing was too much trouble for them. Everything is taken care of and staff always on hand to fulfil any of your requests! The property was very clean and love the jacuzzi tub in the bathroom! The pool size was extremely good for the two bed villa. Most comfortable lounges by the pool. Design and lay out of the our two bed villa was superb and so were the garden surrounding it. Fab view of the coconut trees from our sun lounges. Definitely recommend the complimentary bike ride around the rice fields and village. Cooking class was fantastic and food was delicious! Loved the champagne on arrival and also a private shuttle service anywhere in Ubud as the property was a short drive from the centre. This service was a very handy option that is included in the price of the hotel which saved a lot of the hassle of hailing down taxi’s. Love this service! We loved the fact that it wasn’t in the ubud center, making it a quiet place for family (superb view at breakfast, overlooking the rice terraces!). Samaya also offers free shuttle service for pick-ups and drop-offs at anywhere in the ubud center so it really doesn’t matter that it isn’t in the city center. All staff was super friendly and responsive. Thanks for the experience! The breakfasts were great and the staff always very attentive and friendly. Our manager Putu was very helpful and lovely to us. Incredible tranquil and stunning location with wonderful staff and amenities, one of the best hotels I have ever stayed in, and I travel 2-3 months a year! Spectacular villa and amazing staff. They really get to know you well and all your likes and dislikes. They only asked once about our preferences and the entire team knew. I am vegetarian and my partner is not but also he specifically didn’t want to eat pork and they offered alternatives and good suggestions and always brought out the vegetarian menu for me without me having to remind them. The manager of the restaurant came out to greet us personally when we arrived and the food was amazing. I know it sounds unbelievable but I promise you...you will literally feel “SWEPT AWAY” there is no better name for it. The Samaya hotel has no words to describe it. Just don’t bother looking at any other hotel. You will seriously be thankful for booking this place. Highly recommend... it will exceed your expectations even when you think they have already done so. All the staff made sure you felt like you are being pampered and they surprised us with lovely things for our anniversary. Everything was perfect from stuff to facilities, breakfast, the pool, etc. The place is so peaceful and beautiful... Villas are amazing, clean, cozy, spacious. The service is top class, location on the river is spectacular. Staff is very professional and helpful. The choice for the breakfast is very good, food is top quality, the view from the restaurant is breathtaking! Lock in a great price for The Samaya Ubud - rated 9.6 by recent guests. The Samaya Ubud has been welcoming Booking.com guests since 2 Jul 2010. 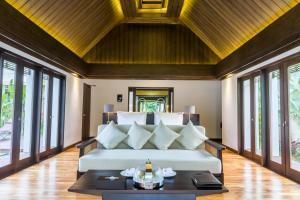 When would you like to stay at The Samaya Ubud? Situated either on the upper level complex of the resort or close to Ayung River. Featuring a private pool, the spacious villa is surrounded by beautiful tropical garden. All-day breakfast can be enjoyed once a day at Scene Restaurant or in the villa, at any time within 24 hours. 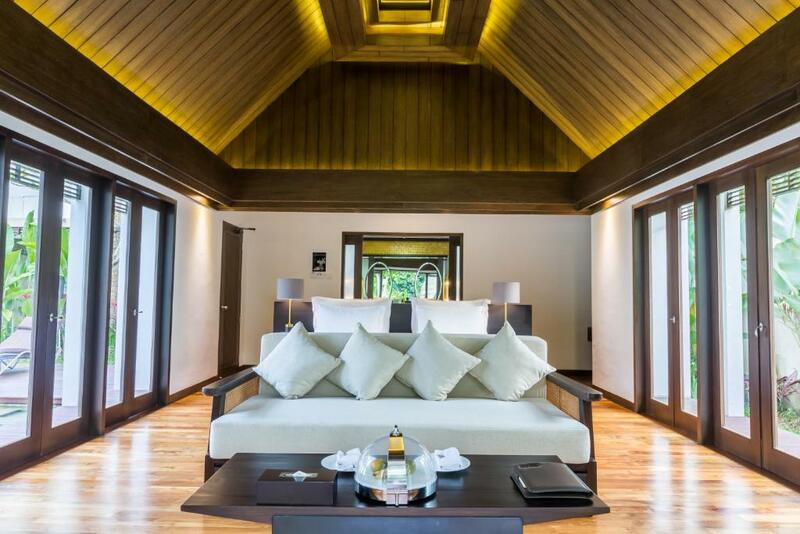 Situated right in front of the Ayung River and natural tropical forest, this villa is designed with modern and elegant decor. It features a private swimming pool next to the bedroom. 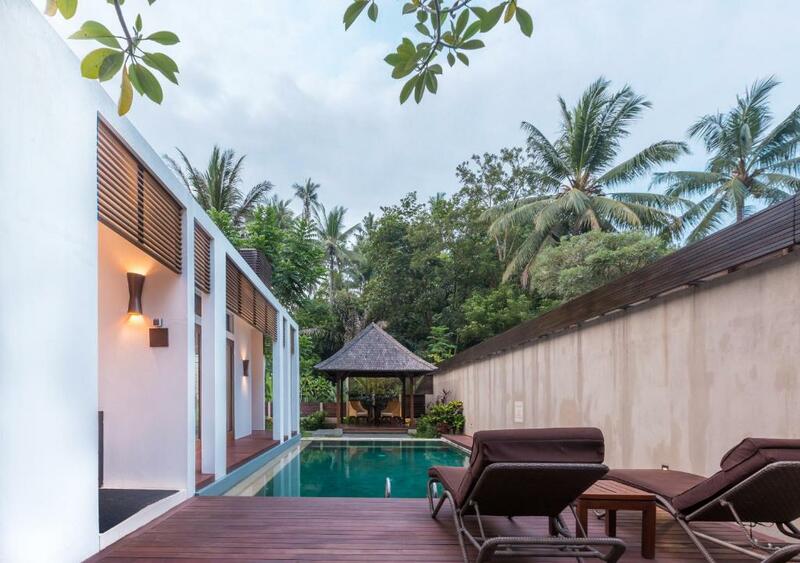 Featuring a private pool, this villa is suitable for up to 4 persons. It has an outdoor dining area overlooking the tropical garden. Suitable for up to 6 persons, this spacious villa features a private pool and lush tropical garden. It has an outdoor dining area, a seating area and a private bathroom. Offering views of the mountain, this bedroom features a private pool and a hot tub. 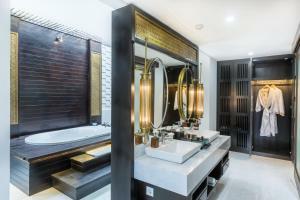 It has a seating area, a dining room and a private bathroom. The Samaya Ubud is where the guests can experience the unique delivery of Balinese hospitality in superb natural location set alongside the Ayung River. The Samaya Ubud is a 15-minute drive from central Ubud. Featuring Free 24-hours shuttle service to the central Ubud anytime with prior booking, WiFi throughout the resort, wellness center complete with gym and outdoor main pool. The guest can also enjoy cycling, trekking, and morning yoga activities with free of charge based on Hotel schedule. Cooking class will be provided with prior booking and additional charge. With spacious luxurious villas, The Samaya Ubud offer guest’s privacy at an ideal place to relax in a tropical paradise surrounded by rice fields, hillsides, and Ayung River. Guests can enjoy spa treatments in-villa, spa by the Ayung Riverside, or at Ayung Riverside Spa Centre with private sauna room, steam room, and Jacuzzi. Laundry, dry cleaning and car rental services are available. The famous Swept Away Restaurant offers Special Romantic Hundred Candle Light Dinner where the guests can enjoy a truly unique dining experience with the sound of natures by the Ayung River. I joined the management with many years experiences in hospitality industry. Since September 2018, I am as Hotel Manager of The Samaya Ubud property happy to welcoming our guests with full responsibility. With my experience in developing and taking care of outlets at Four Seasons Bali, Me and my team aim is to ensure your special holiday at The Samaya Ubud will exceed expectations. House rules The Samaya Ubud takes special requests - add in the next step! The Samaya Ubud accepts these cards and reserves the right to temporarily hold an amount prior to arrival. Please inform The Samaya Ubud in advance of your expected arrival time. You can use the Special Requests box when booking, or contact the property directly with the contact details provided in your confirmation. A bit dark in our villa; more lights would be great. We look forward to when the Hill View Room, which we had booked, will be ready. The Hill Side Room was still fine although I would have preferred the view. Maybe next time! One of the best hotel in Bali, amazing service!!! The mattress of the bed was a bit uncomfortable. Staff was really attentive and cared. The room are large and pleasant architecture. Location a bit far away- but free shuttle service great.